I'm excited to be participating in the October Waltzingmouse Pajama Party tonight! Each month Claire hosts a Pajama Party with fun challenges and great prizes (think WMS stamps!!). Three of the challenges are revealed on the 1st of each month and have to be linked up within 24 hours of the party - but the 4th challenge is a sketch and you have one week from now to link it up over on the WMS blog. I found some colorful bottles at the Christmas tree shop for $1.00 each - I bought 3 (you'll see the others below). I was thinking I would decorate them and put candy in them to sell at our church fair this month - but I found a label on the bottom after I got them home that said "Not Food or Water Safe" - so I had to rethink the purpose - and then I found refill bottles of Vanilla Pumpkin oil for reed diffusers at Home Goods and snapped some up for these bottles! I purchased some wooden barbecue skewers at the grocery store to include to put inside the bottles. The stamp on the Toad oil round label and the newt below are from Wanda's Pantry - the Oct 31st is from Vintage Witch and the label frame and Happy Haunting are from All Hallows Eve. I stamped To: and From: on the back of the label for gift giving - these are from Wanda's Pantry but they are also included in many of Claire's sets. I used another one of my bottles for this challenge - I figured purple was a good Victorian color and this St. John's Wort verse from All Hallows Eve was old school spooky! And actually - I think all of these bottles are decorated in Old School Spooky! Here's my third bottle - a blue one (bat droppings from Wanda's Pantry) - they make a nice set don't they???? And the Vanilla Pumpkin oil inside smells so wonderfully fall when you put the diffuser reeds in the bottles! I placed this warning on the back using my Brother's P-Touch label Maker just so the receiver would know what it was and NOT to drink it!! For this challenge I made three 2"x2 inch magnetic bookmarks using Putting on the Ritz. I love to read, and I love reading real books (not Kindles etc although I do have one!) - and I use these magnetic bookmarks all the time to mark the page and line that I stopped reading on. 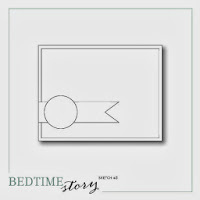 Being on the Waltzingmouse Design Team has it's advantages - and one of them is receiving the Bedtime Story sketch early! I turned the sketch on it's side. I used Spooky Tree, a sentiment from All Hallows Eve and the bats and star are from Midnight Feast. I stamped the tree on a white panel, masked a circle and sponged the panel in Ranger Distress Stormy Sky and Chipped Sapphire. I added a strip of washi tape and the sentiment circle popped up on foam tape. So there you go - this is one spooky post don't you think?? with a little art deco thrown in the mix!! Are you coming to the WMS Pajama party this month!! We'd love to have you join us! You will find all the details on the WMS blog here. We Made It! The Waltzingmouse August Release Day is here! Today is the anxiously awaited Waltzingmouse August Release Day - all of the new stamps are now available for purchase at the WMS shop! 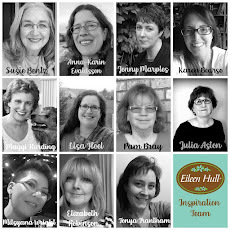 And as is our custom - the Design Team is having a blog hop and you can win some WMS stamps! You should start the hop with Claire at the WMS Blog. She will have a master list there if you lose your way. If you came here from Sandie's blog you are in the right place! First up I have a simple book mark using stamps from Tying the Knot. And my last project for today is a decorated canvas frame - featuring my sweet grandnephew, James and his dad, Nate, as well as flowers and from 2-Step Sprig, the leaf stem from Simple Sprig and two sentiments from the Vintage Garden Seed Packet set released in Aug 2012. Two year old James loves to help his mum and dad out in the yard and in the backyard vegetable garden. I thought it would be nice to remember his helping out with a special frame for this photo. I painted the canvas frame with Antique Linen Distress Crackle Paint to simulate the garden soil. I inked the flowers in blue and green to coordinate with the dominant colors in the photo. I brushed all the blooms and leaf stem with Glitter Glaze Clear Sparkle. You can see the crackle in the paint on this close up. I sponged Peeled Paint ink over the crackle. That's it for me! I hope you have fun along the blog hop today - and that you're inspired to create your own garden and nautical creations with all the lovely new WMS stamp sets! Next on the hop is Laurie! There will be a prize of a stamp set of choice from a random drawing from comments left on all of the DT's blogs. You have until August 12 at 11:59 PM GMT, 5:59 AM Central, 3:59 AM Pacific and 6:59 AM Eastern to leave comments. 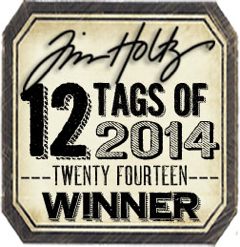 The winner will be posted on the Waltzingmouse Blog on August 14th. Accessories: Rope twine - SU, Jumbo Eyelet - SU, cropadile, Zutter corner rounder. Accessories: canvas frame - Michaels, 1" circle punch - EK Success, foam tape, Distress Crackle Paint Antique Linen - Ranger, photo, curly label punch - SU, Sparkle Thicker Alphabet - American Crafts, Glitter Glaze Shear Sparkle - MFT. 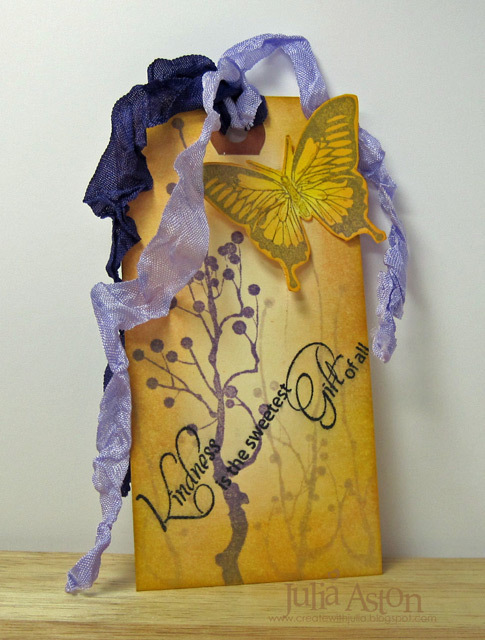 This is also for the SCS Queen for the Day, who is Glowbug - I cased her In the Garden bookmark. 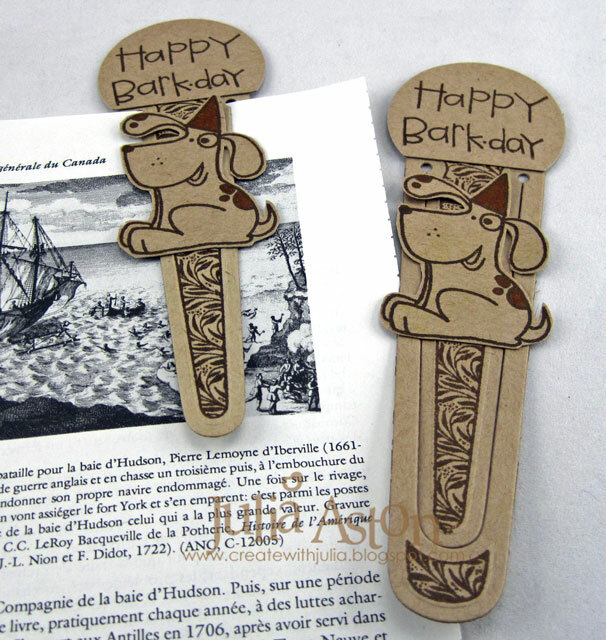 I used a different stamp on the bookmark, brown instead of blue, and I added the dog stamp and birthday sentiment. The dog and sentiment are from Paper Smooches. The bookmark stamp and die are from Our Daily Bread Designs. And finally this is also for the Cas-ual Friday challenge - to use Kraft. My picture shows two bookmarks - one slipped on a page and the other taken off the page so you can see the full size. I kept it all flat so it wouldn't be bulky when in use! 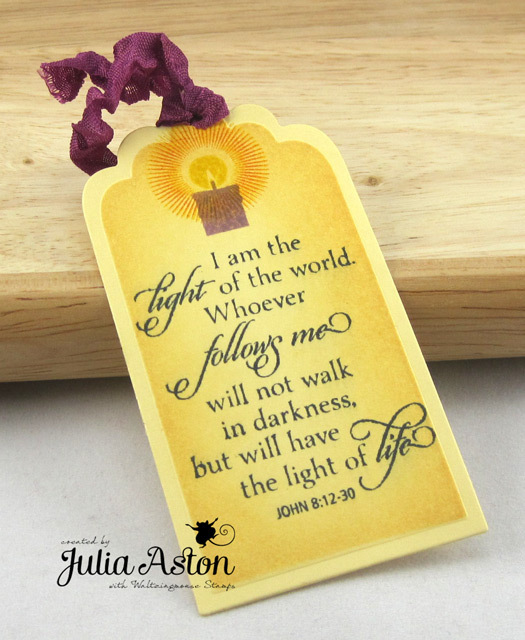 I love to read - and therefore - I love finding new styles of bookmarks to make using my stamps! 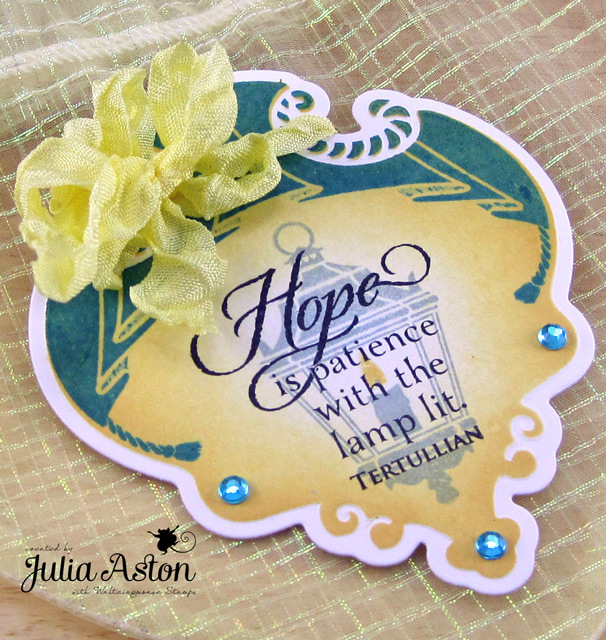 This fun design was Joan's Technique Lover's challenge over on Split Coast this week. It's the kind of bookmark that slips over the page - a foldover bookmark! 1. Cut a piece of card stock 2" x 11" and fold in half so it measures 2" x 5 1/2" (or use a scrap of card stock near the same size). 2. Cut the top corners in the shape of a tag ( or use a die for a fancy shape) and punch a hole in the center top for ribbons or twine. 3. Sew through the front and back about 1/2" from the top so the bookmark will stay closed and not flop open. If you don't sew, you can glue the front and back together on the inside from the fold down about 1/2 to 3/4 of an inch. 4. 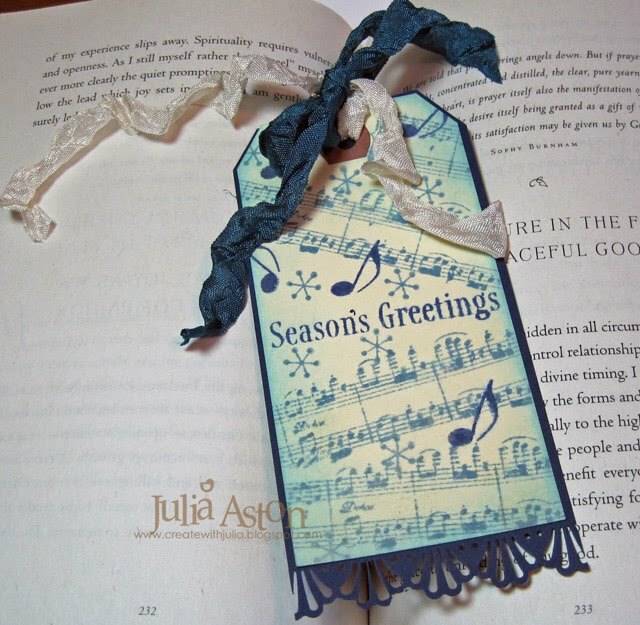 Now, decorate anyway you want...remember to keep it flat so the bookmark will fit over the page snuggly!!! I stamped a crackle background on a white panel then stamped the box words over it. 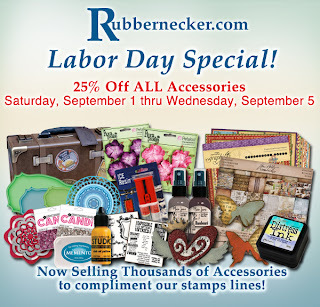 My stamps are from Rubbernecker. My sewing machine and I are not on the best of terms right now (!) so I just put a piece of ScorTape across the inside just above the stamped panel. I think this design would work for both male or female even though there is ribbon at the top! You will find Joan's challenge on Split Coast here. ETA: check out this Rubbernecker sale! We have finally arrived at the August Waltzingmouse New Release day! All of the sets the Design Team has been showing you for the last 3 days are now available for purchase at the WMS Shop! We are celebrating the release with our traditional WMS Design Team Blog Waltz. And as always - you can win a stamp set of choice from this release - see details at the end of my post. The waltz begins at Claire's blog . 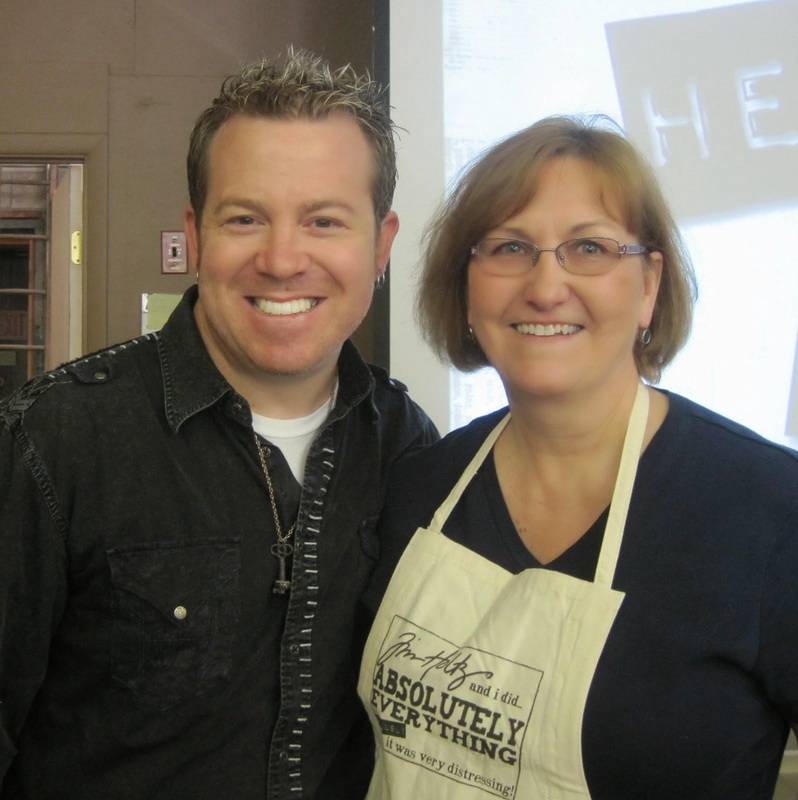 If you came here from Sandie's blog - you are in the right place! I have two projects to share with you today. Lots of pics so I tried to keep the chatter to a minimum!! 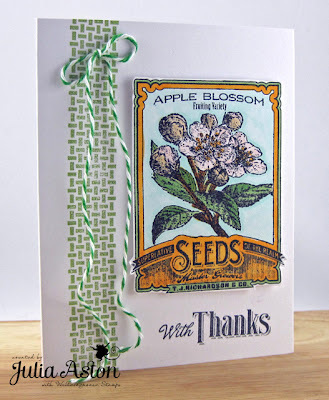 First I made a tag using stamps from the full size stamp set Vintage Seed Packet. I used the tag to dress up my plain Ball Mason jar full of flowers to give a friend. I stamped the label, colored it with Copics, cut it out and layered it to purple and then black card stock panels. I punched a hole in the top of the black piece and tied it around the neck of the jar with wrinkled seam tape. I also stamped the little trowel from this set, colored it with Copics, cut it out and layered it over the tag - isn't it cute?! I filled the jar with some flowers from my garden - Buddleia (Butterfly Bush), Red Sedum (that just has a tinge of red on it right now) and a single daisy! How pretty is this??!! I also decorated a little heart shaped bag from Pouch Mart. I stamped the opera tag on white, cut it with one of the WMS opera tag dies and sponged the edges before taking it out of the die. I stamped a lantern, candle and flame from Little Lanterns and a sentiment from Light of the World Sentiments. I tied the tag to the bag using a large eye needle and wrinkled seam tape -I poked the needle right through the bag - brought the seam tape down into the bag in one spot and up out of the bag in another - tying the ribbon through the curves in the top of the opera tag. I also added a few pieces of ScorTape to the back of the tag. This will hold the tag on securely. 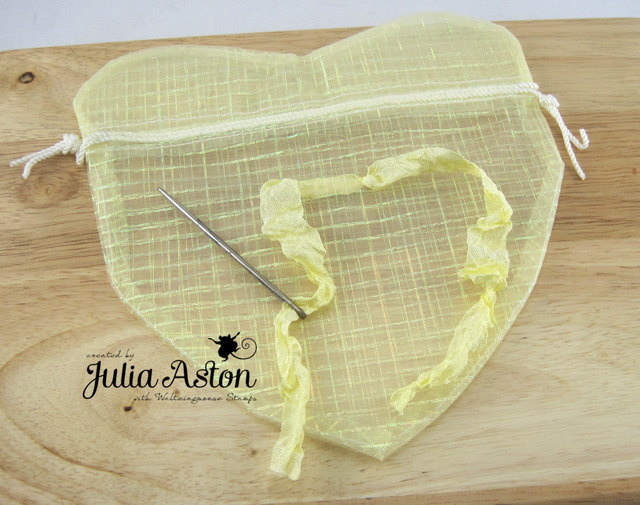 Below you can see the heart shape of this pretty bag when it's open (with the seam tape threaded through it). The threads in the bag are golden as you can see in the above pic. I also made 3 tags/bookmarks to go inside my bag, again using stamps from Little Lanterns and Light of the World. I made this little gift set to give to a friend who is going through some difficult times and will appreciate reading these encouraging verses. She could use them as bookmarks or just prop them up on a shelf or counter to read whenever she passes by them. 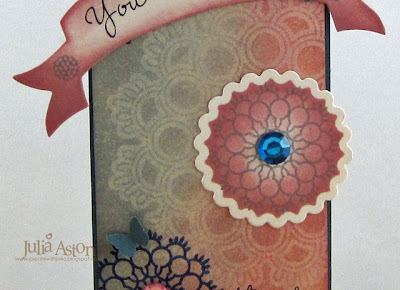 The tags are a Scalloped Tag die from Spellbinders. 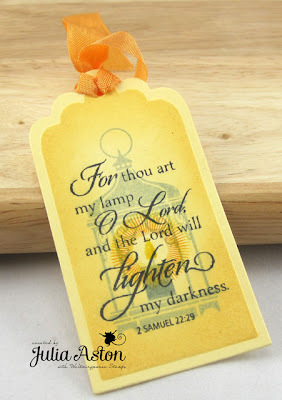 I stamped the lanterns in London Fog Ink so they didn't obstruct the verses. I just love the variety of lamp shapes, candle, flame and glow sizes included in this set! 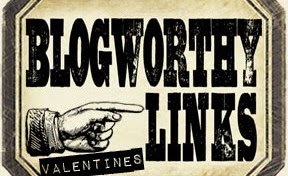 We hope you have enjoyed and been inspired by our previews the past 3 days - and our Blog Waltz today! There will be a prize of a stamp set of choice from the new release. There will be a random drawing of the winner from comments left on all of the Design Team blogs on the Waltz today. You have until August 26th 6:59 AM Eastern to leave comments. The winner will be posted on Claire’s blog on Tuesday August 28th. I am the last person on the Waltz - we're so happy you danced with us today! If you missed anyone - you will find the complete list here! And you can now purchase all the new stamps at the WMS Shop! Accessories: Rhinestones - Kaiser, Ball Mason Jar - grocery or hardware store, Copics: G40, E35, Y13, V04, BG10, T2, wrinkled seam tape - Prairie Bird Boutique Etsy Shop, Cropadile. Ink: Memento - Sweet Plum, Tuxedo Black, London Fog, Teal Zeal, Ranger Distress - Scattered Straw, Mustard Seed, Spiced Marmelade. Accessories: heart shaped organza bag - Pouch Mart.com, Opera Tag Die - WMS/Spellbinders, Scalloped Tag Die - Spellbinders, ScorTape, large eye needle, wrinkled seam tape - Prairie Bird Boutique Etsy Shop, rhinestones - Bazzill Basics. Welcome Stamping Friends! For the next three days I, and my fellow WMS Design Team Members, will be previewing all of the wonderful new stamps sets Claire has created for the Waltzingmouse August Release that will be available on Friday August 24th. Today the Design Team is working with wonderful Vintage Garden sets - There are 3 mini sets - Vintage Garden Produce, Vintage Garden Flowers, Vintage Garden Appleblossom Seeds and a full size set, Vintage Seed Garden. 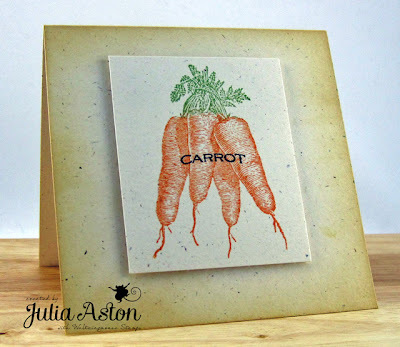 For my first project, I made a card using the vintage carrot image from Vintage Garden Produce, inking it with orange and green and stamping it on a panel of Rustic Cream card stock. I stamped the word 'carrot' right over the image. I layered the stamped panel over the Rustic Cream card using foam tape and sponged the edges of the card with Antique Linen. Very clean and simple focusing on the lovely detail of the image! This makes a lovely note card. 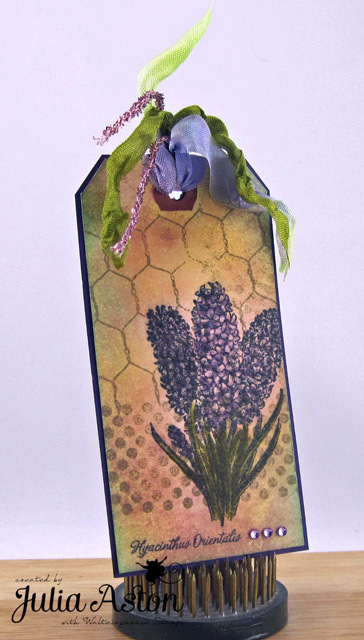 Next, I made a tag using this pretty hyacinth and the Latin name of the flower stamp from the mini set Vintage Garden Flowers. I just love the smell of hyacinths when they bloom in my garden around Easter time each spring! 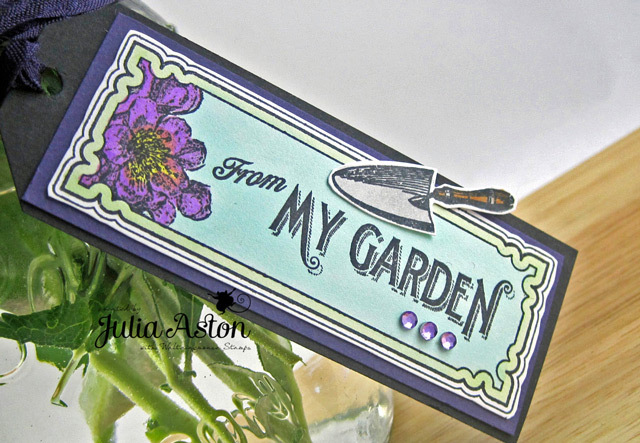 This would make a lovely bookmark for a friend who gardens or who just loves flowers! I used a shipping tag, coloring it by running my Victorian Velvet Distress ink pad across my non-stick craft mat, spritzing it with water and dragging the tag through it. 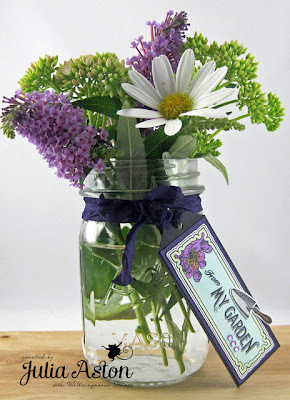 I dried it with my hot gun and stamped the hyacinth and Latin name with black ink. I colored the plant using Cut-n-Dry pen nibs and distress inks. I stamped the background using a stamp from the Chicken Wire set and the dotted background from Off Beat Backgrounds. Then I sponged the edges of the tag with Scattered Straw and Tumbled Glass Distress Inks. I layered the tag to a piece of purple card stock, added 3 rhinestones and looped two colored seam tapes and a shimmer cord through the hole. 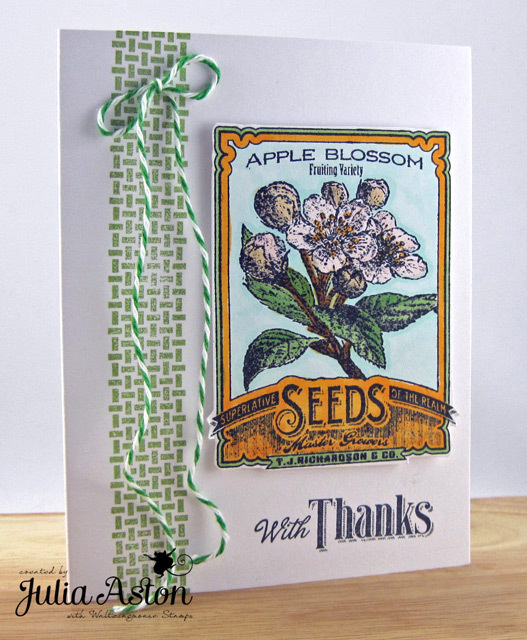 For my last project today - I made a card using the stamp sold singly called Vintage Garden Appleblossom Seeds. The sentiment is from a set we'll be previewing tomorrow and the background panel is from Pic-Nic Patterns. I colored the seed pack image with Copics, cut it out and layered it on the white card with foam tape. 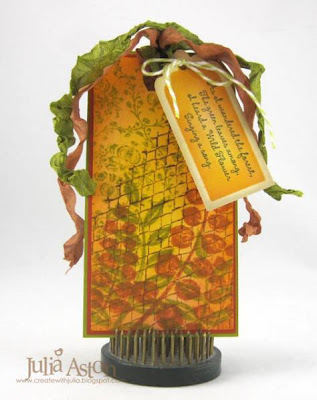 I made this card for the Featured Stamper Challenge on Split Coast and I CASED this card of Maureens changing images but using her basic sketch and garden theme. Now let's go and see what the following Design Team Members have created today! Please stop by tomorrow for Preview Day #2! Ink: Memento Tuxedo Black, Bamboo Leaves, Tangelo, Ranger Distress Antique Linen. Stamps: Waltzingmouse - Vintage Garden Flowers (to be released 8/24), Chicken Wire, Off Beat Backgrounds. Ink: Ranger Distress - Black Soot, Scattered straw, frayed burlap, tumbled glass, dusty concord, peeled paint, Victorian Velvet. Accessories: Copics - G82, E53, E37, BG10, Y38, ROO, Peabod Twine - The Twinery, foam tape, glue dots. Hi stamping friends! The weekend's just a few hours away - I don't know about you - but I can't wait! It's such a good feeling knowing I have two days off! 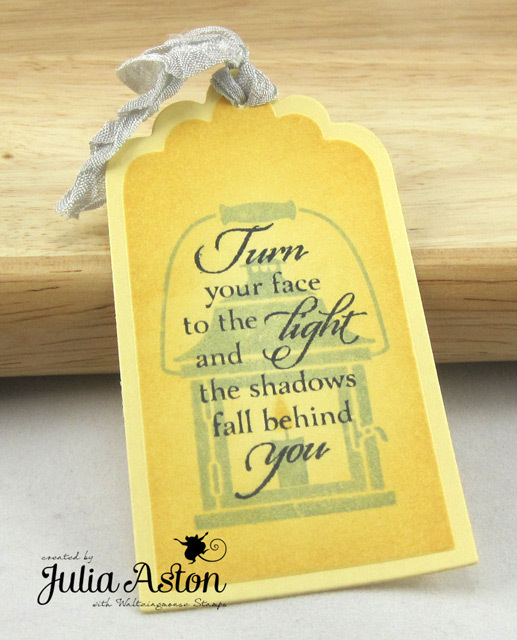 I made a bookmark for the Looking Back - Ways to Use It challenge over on Split Coast. I cut a piece of white card stock 2 1/2 x 5 3/8, cut off the top corners and sponged all over with Victorian Velvet, Weathered Wood and Shabby Shutters. First, I stamped the piano keyboard along the edge. Then I adhered the punched music score to the bottom, stamped the sheet music at an angle, and stamped the G clef and notes. My music stamps are from Musical Backgrounds by Waltzingmouse . 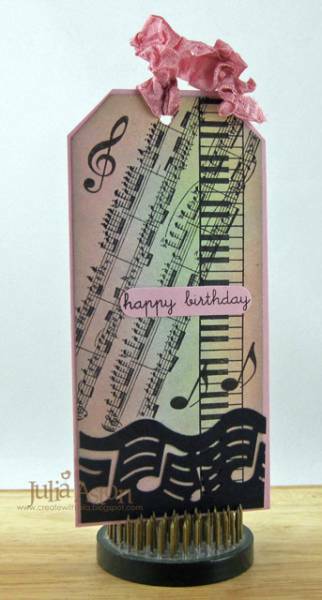 I stamped happy birthday from Birthday Basics by PTI on a piece of Lavender Moon card stock, punched it with my word window punch and adhered it over the stampings. Then I layered it to a 2 5/8 x 5 1/2 piece of Lavender Moon, punched a hole in the top and looped the wrinkled seam tape through the hole. To finish it off - I stamped a birthday sentiment on the back. 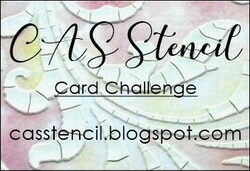 My second card was made using a really fun technique for the Try a New Technique challenge on SCS - Inspired by Belleek. 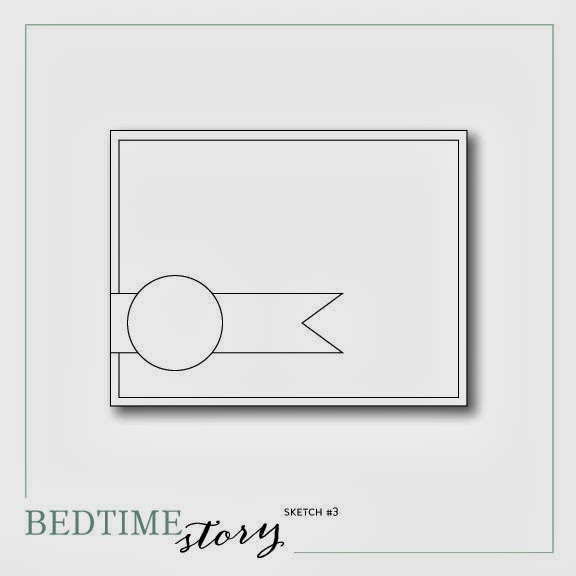 You ink up the inside front cover of an embossing folder with a tan or gray ink pad. Then put your card stock inside and emboss it. The result looks very much like Belleek Pottery! I have been to the Belleek Factory in Ireland and you'll see in my picture, one of the miniature vases I purchased there. This vase has a tall grasses design so I used my Bird Call Embossing folder as it has tall marsh grasses. I used River Rock Ink on my embossing folder and cut a panel out of the embossed piece of cardstock that I adhered to my textured card with foam tape. 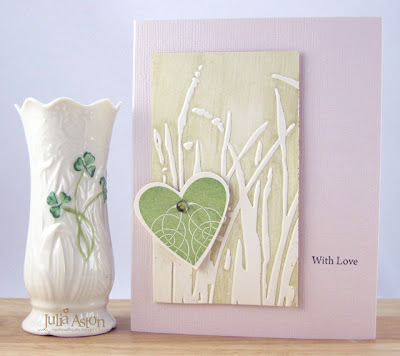 I stamped a Celtic heart in green and adhered it over the inked embossing with foam tape. Then I just stamped the simple sentiment on the side and added a rhinestone to the heart! My stamps are from Celtic Heritage by Waltzingmouse. Have a nice weekend everyone! I'll be back on Sunday with my Sisterhood Sunday challenge card - hope you can stop by then and also join in on the challenge! 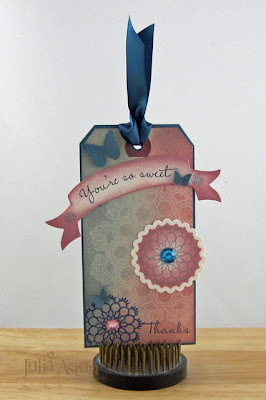 I made this tag for last week's Ways to Use it Challenge over on Split Coast. The challenge was to do collage stamping. Collage stamping is a great way to create a decorative tag. This could be used as a bookmark, a card or a gift tag. I used 4 stamps from Rubbernecker for the collage part - a wire grid background, a Victorian Damask background and two foliage stamps. I also stamped a sentiment on a tag and hung it from the ribbons with a piece of twine. The sentiment says "As I wandered the forest, the green leaves among, I heard a Wild Flower Singing a song. 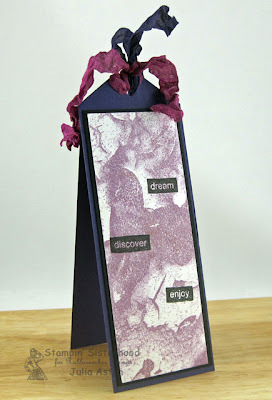 I did lots of sponging on the tag and layered it to two pieces of colored card stock. 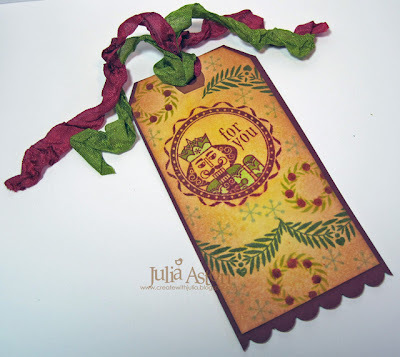 To see a step by step tutorial on how I made this tag - check it out over at the Rubbernecker Blog! Sweet Peek - Sweet 'n Sassy Stamps - Love is Like a Tree! If you're looking for my Waltzingmouse Sneak peek - please scroll down to the post below this! 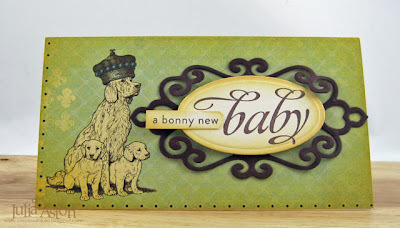 Today I'm excited to be showing you a Sweet Peek at a fun new stamp set from the Sweet 'n Sassy Stamps July 1 Release. It's called Love is Like a Tree. I've been loving making tags lately - using simple oaktag shipping labels from Staples. I sponged the tag with Old Paper and Victorian Velvet Ranger Distress inks. 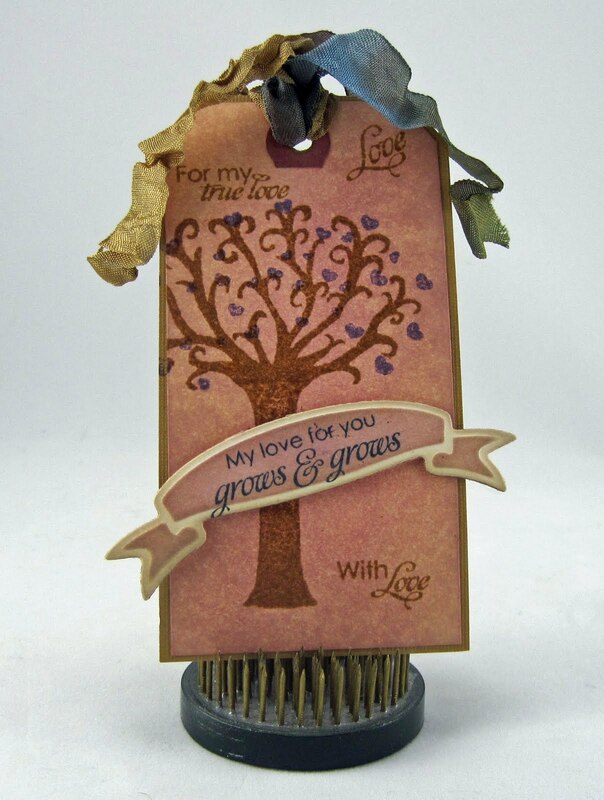 Then I stamped the tree, the little sentiments and the heart 'leaves' on the card. 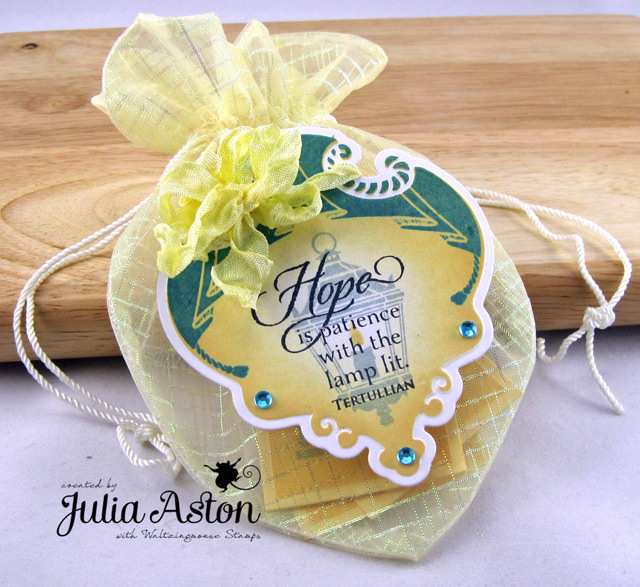 I stamped the sentiment and cut it with a Ribbon Banner Shapeability, sponging it with ink before removing it from the die. I layered the tag to a piece of tan Bazzill card stock, punched a hole at the top and threaded wrinkled seam tape through it. 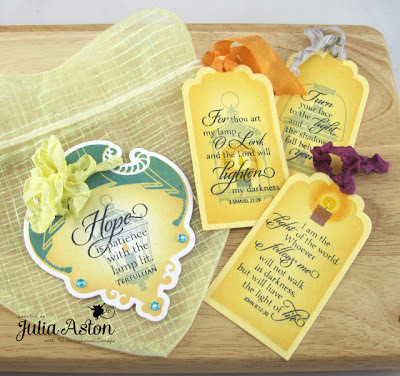 I hope you'll hop over to the Sweet 'n Sassy blog to find the links to the other Design Team members who are Sweet Peeking this pretty set today! Ink: Memento Tuxedo Black, Ranger Distress Old Paper, Victorian Velvet, Vintage Photo, Dusty Concord, Brushed Corduroy. Accessories: Ribbon Banners Shapeabilities, wrinkled Seam Tape, cropadile. Hello dear friends! Welcome to Day #2 of the Waltzingmouse Sept Release Sneak Peeks! Didn't you just love everyone's creations yesterday?! Today I made some tags. On my first project - I used the new Nutcracker Sweet set that has this great round stamp with the nutcraker's head and sentiment in it, the pretty garland, wreath and berries as well as the snowflake! There are also two complete nutcrackers as well as two size Christmas Trees plus many more sentiments and little trimmings! First I did all the stamping - then I sponged around the edges with Ranger Tea Dye Ink and swiped down the center with Mustard Seed to brighten it. 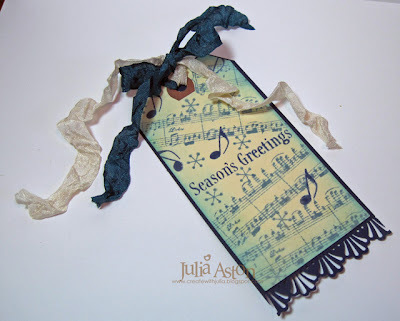 I layered the store bought tag to a piece of cardstock that I had punched on the bottom edge. Then I just trimmed close to all the edges around the tag. Finally, I spritzed the tag using a mini-mister filled with water and a little bit of Gold Perfect Pearls. It has a little shimmer all over IRL - hard to see in the pic. This would make a lovely gift tag. For my second tag I used a sentiment and snowflake from Nutcracker Sweet as well as two stamps from the Music Background set. I stamped one of the music stamps randomly on the tag as well as some single notes. Again - I sponged the edges, this time with Tumbled Glass, adhered the tag to a piece of punched card stock and spritzed with the water and Gold Perfect Pearls mix. It can blur the ink a little but I like the look! This would make a nice gift tag or bookmark don't you think? Are you getting excited about all the new sets Claire has designed for us??! They'll be available to purchase on Sunday, Sept 12th so start writing down your wish list! Off you go to check out Claire and the DT members linked below - let's see what new sets they are working with today! I'll be checking them out right along with you! We'll be here again tomorrow with more exciting things to show you! Can you stand it?!?!? Accessories: Copics: YG11, YG95, E50, Mini-Mister, Perfect Pearls Gold, wrinkled Seam Binding - www.PrairieBirdBoutique.etsy.com, scalloped edge punch - SU, lacey edge punch - Martha Stewart, blending tool Inkssentials Ranger.